If you haven’t yet used Airbnb, I’d love it if you used my affiliate code. As you see, I do not monetize this site with ads. With the code, you and I both get a $35 travel credit the first time you travel. 2. The Investor: They’ve figured out they can make money from AirBnB. They have more than two apartments. The apartments are furnished head to toe with items from Ikea. These are my second choice. If you like a hotel, these may be perfect for you. For me, they lack a little bit of soul, but still beat out any hotel. With these hosts, you will need to look at reviews carefully. 3. The Realtor: I try to steer clear of these. Realtors have multiple listings and don’t have a personal connection to their place. Some are great, others are horrible. You need to do extra research and really scrutinize their reviews before staying with this type of host. Seven years later, we’re still huge fans of Airbnb. We’ve had mostly good experiences, some amazing ones, and very few negative ones. Over the years, we’ve learned what makes a good host. If you’re new to Airbnb, there’s no need to worry. I’ll give you my tips to selecting the perfect apartment for your needs. If you have more questions or want advice, leave it in the comments and I’ll get back to you ASAP. 1. Start with Amenities: There are certain things you need. For me, it’s four things: fast internet, a washing machine, a kitchen, and temperature control. I do not even bother to look at apartments that do not have these amenities. These items may be different for you. Don’t budge. I find that those times I’ve sacrificed these needs for either cheaper cost or neighborhood, I’ve been disappointed (and I can blame no-one but myself). 3. Check out Host Profiles: This is HUGE. First, make sure your host is verified. The more verifications, the better. Then check their write ups. See if your host has similar interests to you. Check out their reviews from hosts to find out where they have traveled. If your host has traveled to locations you’ve traveled to, they will probably fit your travel style. Check out their write up for interests. If they love cooking – and you do too – chances are their kitchen will fit your needs. 4. Photos: I will not stay at a listing that has no photos/bad photos. I am of the belief that details matter, and if you have not taken the time to put TLC into your listing, you probably won’t do the same with your home. You also don’t want any surprises. If the apartment looks cluttered, there may not be a place for your stuff. Is their closet full of clothes? Then you need to ask this host if you will have space for your items. Put the photos into context. Check out the photos to see if there is enough counter space, if the kitchen is good, if there is a shower curtain…you get the gist. 6. House Rules: Read these. You don’t want surprises when you get to your host’s home. Some homes don’t allow alcohol. I’m a wino – this would never work for me. Other hosts will charge you a cleaning fee (I am totally ok with this – you may not be), or a late check in fee. Make sure you read these thoroughly. 7. Ask for a Discount: Don’t do this if you’re just staying for a week or two, but if you’re staying for more than 15 days, it is totally ok to ask for a discount. They can decline the discount, and you can still take the place at full price if you really love it. Is the hot water stable? A lot of European/Latin American listings don’t have hot water or have unreliable heaters. There are few pleasures to life like a hot shower and I’m big about making sure I have one daily. Will a cleaning person come in weekly? I think all hosts should add a weekly cleaning service to the cost of the listing. It just helps you to not have to work extra (and their cleaning person can make sure you as a host are not messing up the house or breaking things – benefits both parties). 9. Check them out on Social: You’d be surprised how easy it is to find people’s profiles on Facebook, Twitter, and even Google+. I like to stalk really get to know my hosts before staying with them. 10. Cancellation Policy: This year while we were in Portugal, we got two pieces of bad news. This meant that we had to fly back to the US in just a few days. We ate the cost of the rest of our rental since we were already there. Things like this can happen. They can even happen before you get to your host home. Pay heed to your host’s cancellation policy. There are various types which you can see in more detail at this link. I tend to stick with flexible and moderate, just to be on the safe side. 11. The Spreadsheet: yeah…it’s 11 because I promised a template of my spreadsheet for you. You’ll have to edit this to fit your needs (if you’re a smoker, for example). I’d be thrilled if you had suggestions too, so let me know in the comments. 12. Do a Walkaround: Airbnb will only give you an estimate of where the apartments are. Grab the “address” and copy paste it onto google maps. Do a walk-around. This will give you a nice idea of what the area is like. What do you want to look for? See if there is a bar downstairs from your rental (this could mean it will be loud at night). “Walk” a few blocks, see if there are delis/supermarkets/stores. This will tell you how convenient your area is. Is there a lot of trash on the street. 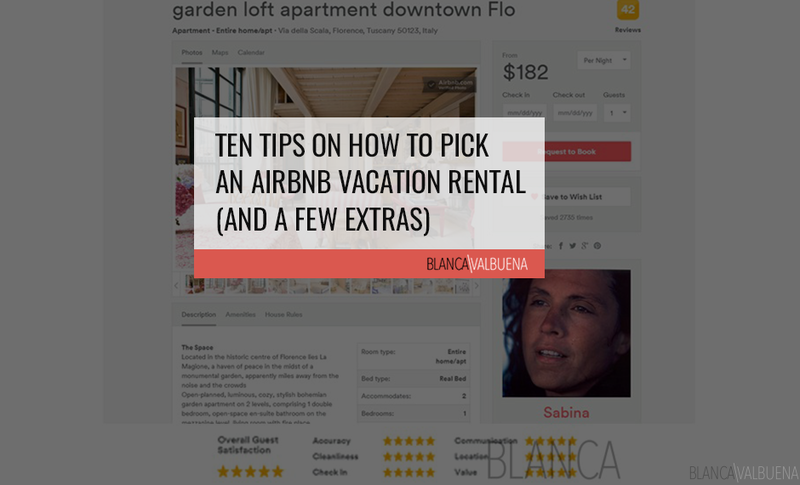 You will be surprised how useful a walk-around will be when choosing your Airbnb rental. 13. 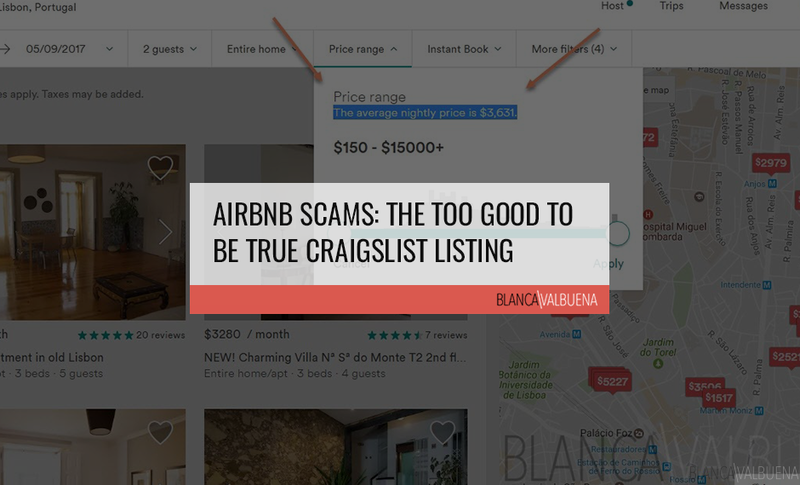 Never Exchange Cash off Airbnb: If your desired host is asking you for contact information or suggests that payment be made off the platform, DO NOT CHOOSE THIS AIRBNB RENTAL. This is a scam and you won’t have any Airbnb protection. Sabina’s AirBnB in Florence was not only a fairy tale, she was an amazing host. Troy’s Scandinavian Airbnb in Hyde Park NY: Troy is the best host we’ve ever stayed with. We broke our only rent an entire house rule because his reviews were so amazing. I can see why he is a superhost. We titled him the 3 Star Michelin of Airbnb. I won’t say more, click through and check out his reviews. Troy is amazing. Matthiew’s Airbnb in Paris: We borrowed a lot of his sense of style. He had an HD projector, we have one in our apartment now. He had a floor bookshelf, we have one now. When we arrived at his place, he greeted us in his silk bathrobe, then sat us down and explained the neighborhood, where to buy the best baguette, what restaurants were worth it and where to go. Staying with him taught us a lot. Sabina’s Airbnb in Florence: I am thrilled to say that we were Sabina’s first Airbnb hosts. She is an amazing host and her home is like no other. I’d tell you to go to Florence just to stay at her house. Little hint…there’s plenty of Medici history to it. Seriously – go – it’s gorgeous. We’ve stayed with her 3 times now. Nuno’s Airbnb in Lisbon: We became friends with Nuno. He’s kinda awesome. He took us to parties, was super attentive, and outside of him being a super host…the apartment was close to perfection and had the most incredible views of Lisboa. Ismael’s Airbnb in Montreal: I was shocked that we were Ismael’s first guests. He thought of everything. The flat had a great gym, a pool and was just a few steps from the arts area. He even treated us to breakfast (not necessary, but so appreciated). He is going to be an incredible host. Aurelie’s Airbnb in Lyon: I think we stayed here either two or three times. The flat is comfortable, super stylish, and just a few blocks from Les Halles de Paul Bocuse. Great location, great value, very nice hosts. A lovely place to stay at during the Fete Des Lumieres. Sara’s Airbnb in Brussels: We never met Sara, but the guy that did the key exchange with her was super patient (our flight was seriously delayed) and very helpful. I think I could have moved into this flat in seconds. The apartment was huge, had three exposures, and super fast internet. This is still one of our favorite homes. Gergely’s Airbnn in Budapest: This is not a huge apartment, but it has absolutely everything you could need in a great location. Gergely and his dad were ridiculously nice and accommodating in every way. I’ve suggested this apartment to many friends who have visited Budapest. You can’t go wrong here. Dorothee’s Airbnb in Jersey City: What a gorgeous apartment! It makes complete sense since Dorothee is an antiques dealer and designers. Her home is an escape from the daily grind. If given a choice, I’d stay here for any future Jersey City stays. Stefania’s Airbnb in Montepulciano: Stefania’s place is gorgeous. She bought a run down palazio and renovated the entire place. There are hand painted ceilings, a stunning view of the Tuscan hills, and a great kitchen. Her place is also right in the middle of the hill, so you’re centrally located. Love her & her place. Paolo & Franziska’s Airbnb in Rome: On the outskirts of Trastevere with any modern amenity you could want. This meant it was quiet at night, just just a few blocks from a bustling night life. We had a HUGE deck with a grill. The internet worked wonderfully, and the shower had consistent hot water. Loved their place and will absolutely stay there again. 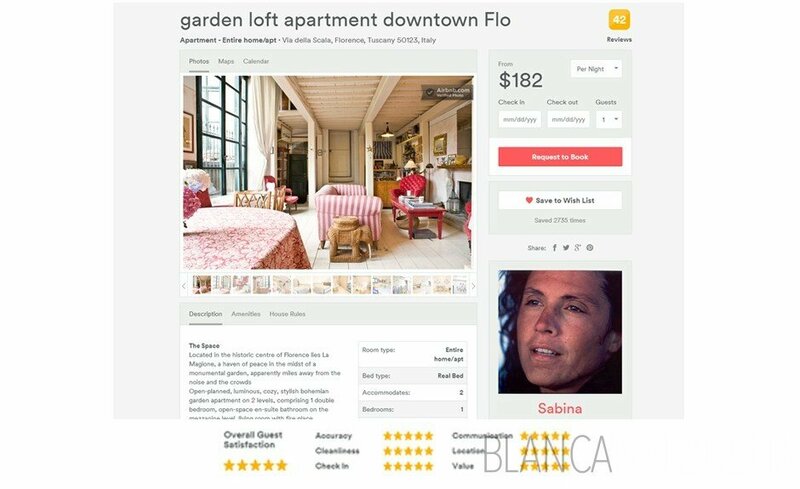 Gabriele’s Airbnb in Venice: Thrilled to add this one to the list. While Venice is not my favorite city in the world (too many tourists, too hard to get around, and so expensive…this flat made our stay so much more pleasant. The apartment was outfitted with gorgeous (and comfortable) furniture. It was next to a canal so we could feel like real Venetians, and it was about 3 blocks away from tons of restaurants and stores. We were able to have a home away from the hustle and bustle, yet get anything we needed when we wanted. Anne’s Airbnb in Paris: Another amazing Paris apartment. Anne’s place was a 2 bedroom with a HUGE deck. It was across the street from a large Casino supermarket and a few blocks from my favorite French market – Picard. I was able to walk to Invalides, the Rodin Museum and much more. She was a bit more sparse as a host, but her apartment gave us everything we needed – and an amazing view of the Eiffel Tower. Bojan’s Airbnb in Pula: Bojan is an artist (make sure to check out his gallery if you go to the city and his apartment fully reflects his amazing aesthetic. Everything worked perfectly (shower, internet), and the kitchen was a pleasure to cook in. Location was great as we were a short walk from the historic center and it was right across from a park which meant it was super quiet at night. As Promised, the followup on Venice. Once you picked your Airbnb rental, you’ll most likely have a great time. We’ve only had about 3 negative experiences, and each time Airbnb has taken great care of us. 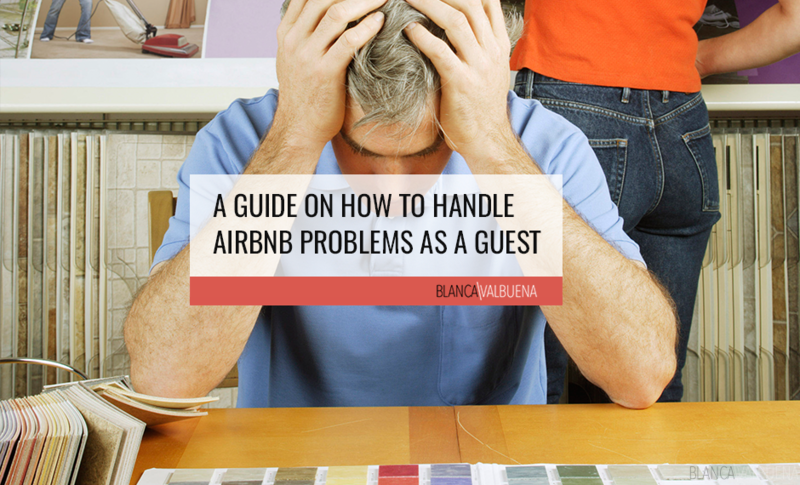 These are the things you should do if you end up running into an issue when you arrive at your Airbnb. Message Airbnb: Just to let them know that there is an issue and that you will be messaging your host to allow them a chance to rectify the situation. You want Airbnb involved during the entire process. How to Message Airbnb: Log on and tweet @AirbnbHelp. Do not air your grievances publicly. Ask them to follow you so you can get assistance with an issue on your trip. I find this is the easiest and quickest way to get in touch with them. Take Pictures: You want to have proof of everything. I do a video on my iPhone on arrival to document what the flat looks like and then I immediately upload it to YouTube (as unlisted) so that I have a date stamp on it. I do this on the date I leave as well so I have proof in case the host ever says something was broken. In this case, if say your flat is dirty when you arrive, do the video and take pictures. Thanks for this information. I found the link on a Reddit post from a few months ago. I just booked two rooms for un upcoming getaway and wish I had seen this before I booked. I’m a huge user of Excel, but it didn’t occur to me to use it for this. Would like more hints as to how to read between the lines in reviews. Sorry I didn’t get back to you earlier…I keep this blog for fun, so I don’t check it as often. Excel is awesome. It really does help and rarely lets me down with this. Let me know if the form works for you and if you end up making changes to it. Always interested in making it better. Reading between the lines…this is especially important with older reviews since before you could read airbnb reviews before reviewing the other person. 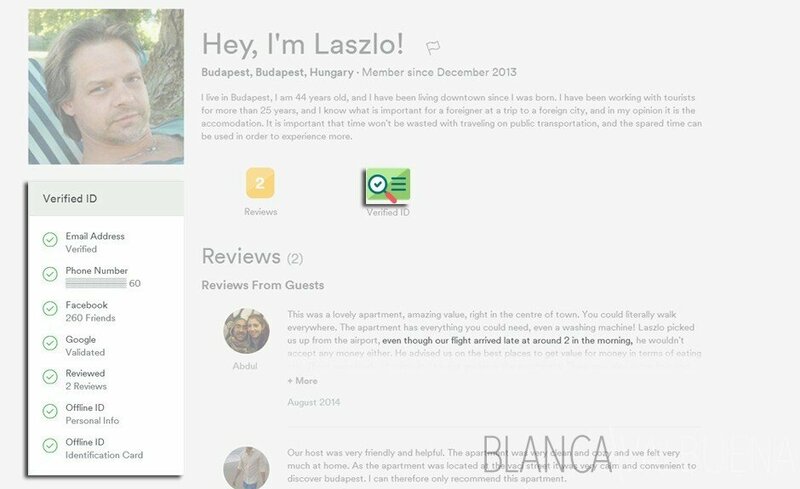 This meant that travelers were a lot kinder with host reviews so they could get a better review themselves. When you read reviews search for key words…cozy usually means the apartment is tiny…or cluttered. Sometimes talkative can mean overbearing. It’s all in the tone of the review. You want to see reviews that say “looks just like the pictures”, or reviews that gush over the property. If someone takes the time to write an amazing review, it’s because the host really blew them away. Let me know how it goes with your apartments. I’ll be updating the Venice apartment video when I arrive. I am currently in Rome and loving my airbnb flat (used the spreadsheet & it didn’t let me down).